Welcome to the most advanced toll finishing facilities in Australia. Equipped with state-of-the-art automated finishing machines and coating technology, we see it as our mission to provide industry with outlandish turnaround times and an unrivalled standard of surface finishing. Our automatic oscillating spraying machine is the most advanced solution in terms of economy of run, reliability and ease of operation, ensuring high productivity combined with the highest quality. The lacquer bouncing effect on the belt assures perfect homogeneity of application between the edge and the top of the panels: the panel lies on the belt and therefore there is no overspray on the bottom side. reciprocating gun holding arms, operated by the PLC. In addition, the operator interface lets us automatically measure the lacquered surface and lacquer consumption. A complete self-diagnostic of the machine is also provided. The solid particles treatment, the EASY W, is operated by a patented self-cleaning system ‘scrubber’. This is placed in the suction tower and automatically filters the exhausted air and controls solid particles to comply with the present requirements (3 mg/m3). A ‘skimmer’ system outside the machine separates lacquer solid contents from water. The Airmix spray gun ensures very high finish quality and product savings. Universally recognised by professionals, ATX spray guns are used in the world’s largest installations in the wood and metal markets. These have some of the f eatures of both pure airless and conventional air guns. The coating is still forced through the nozzle by means of a pneumatic pump (as in an airless gun, but at lower pressure), but some air is added to the fan as it emerges, improving the degree of atomisation. Output is lower than that of a pure airless gun, but precision is greater, and this kind of gun can therefore also be used for top coats. These high-precision, automated spray guns are recommended for jobs requiring small outputs and low-viscosity fluids – for example, staining. 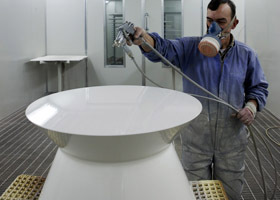 The coating is atomised by means of air pressure (usually 2–3 atm) and forced through a nozzle (usually 1.5–2.5 mm), coming out in the shape of a fan. 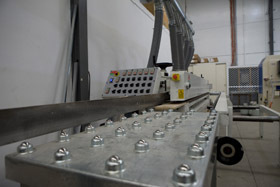 Our roller coating facilities comprise several pairs of inline rollers. Each pair consists of a metal roller and a rubber one, tightened together and rotating in opposite directions (conventional rollers). On operation they are covered by a thin layer of coating, which is continuously pumped between them. 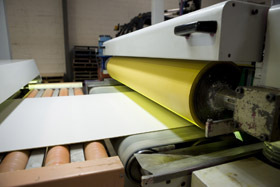 The panels to be coated move on a conveyor and come in touch with the rubber roller, and the coating is transferred onto them. All our rollers have inverting capabilities, which means that reverse rotation of the metal roller can apply an even thinner layer of coating than is possible by the conventional method. We still retain the ability to use older methods of coating. Manual application lets us coat bulky, hard-to-reach items that cannot be processed by automation – usually, shop-fitting pieces or kitchen pieces. By using manual application methods we are able to complete ‘one off’ jobs that require extra special detail and perfection. Calibration - Includes steel contact roller and pad. Ideal for calibration of flooring or any timber material. Finishing - Includes soft contact roller and 2 sectional pads. Ideal for lacquer sanding. 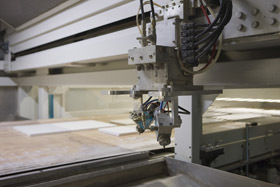 Edge - Our 7-head unit includes a calibration unit for severe saw marks and another 6 units which can be used for raw sanding and lacquer sanding.